D.O.letter.No.2-5/2015-EE-3, dated.23-9-2015 of Smt.Rina Roy, Additional Secretary to GoI, MHRD, New Delhi along with guidelines. U.O.Note.No.Spl/149/A/TE/TSCERT/2015, dated.1-9-2015 of the Director, TSSCERT, Hyderabad. The theme for Kal Utsav this year will be “ Beti Bachao, Beti Padhao”. The style/method of Kal Utsav 2015 is “living Traditions of Art”. (Living Tradition of Art are tribal, folk and Traditional arts of different regions). District Level : This is first level of Kala Utsav, where all schools can send their entries. (If appropriate and convenient, the State may opt to have Kala Utsav at block or tehsil level). State Level : Selected teams from District level will participating at this level. National Level Kala Utsav shall be organized from 8 to 10 December 2015 at National Bal Bhavan, New Delhi . The national level Awards function shall be held at Siri Fort Auditorium on 11th December , 2015. The celebration of arts (with award winning entries at National Level in the Central Park (Connaught Place) shall be organized on 12th December , 2015 for the General public. 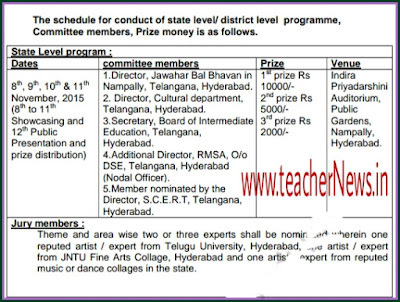 Provide information by 21st November 2015 regarding number of participants and teachers who will attend national level Kala Utsav from our State. Booking of tickets should be done well in advanced T.A of students and teachers/ shall be reimbursed by NCERT.